A few weeks ago I shared a slow statement necklace project, this time I am sharing a really quick and simple earring project. I made these star stud earrings for Cut Out and Keep, they use fancy findings which is such a good/cheats way of adding detail to a project without having to do any additional work - fabulous! 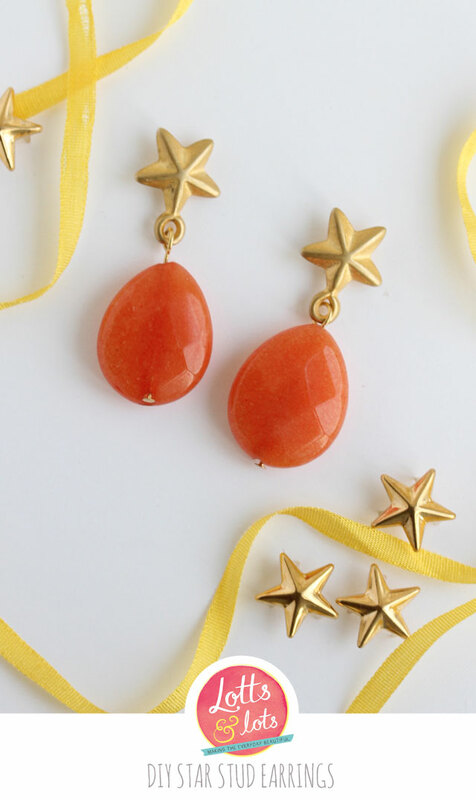 I bought these star earrings from Bijoux Beads in Bath and the dyed jade from Beadies in Amsterdam. I love to collect treasures on my travels, being an experienced bead buyer I'm always on the look out for the unusual and unique, like these stars. If your are a beginner I recommend buying tear drop beads with the hole running the length of the bead, so you don't have to do fancy wire wrapping at the top. Step 1. Thread your beads onto the head-pins and cut the wire approx. 1.2cm from the top of the bead. Step 3. Gently open the wire loop and fix to the earring stand. Close the loop.